There are plenty of prohibition signs, such as No Smoking, in our daily lives. These prohibition, warning or instruction signs can also increasingly be found in industry due to the number of potential hazards. Labour protection is an important issue for every company. When working on machinery, employees are constantly exposed to a variety of hazards such as hot surfaces, electrical voltage or risk of entrapment. Simple and comprehensible safety signs can draw attention to these hazards and thus prevent a lot of accidents. The ISO 7010 standard for safety signs was introduced to ensure that everyone can interpret the hazards correctly. ISO 7010 defines safety signs that are universally comprehensible. This means that new employees or external visitors can immediately identify any hazards lurking in the environment. ISO 7010 has been the applicable standard since the beginning of 2013. If your company still has signs complying with the old DIN 4844-2 standard, you are not obligated to replace them. 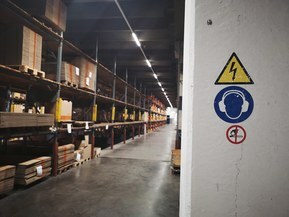 However, in case of damage or accidents, you must demonstrate that the old safety signs meet the same safety standard as the current signs stipulated in the ISO 7010 standard. Because it is very difficult to provide evidence of this, updating the signs to meet the latest standards at the earliest opportunity is advisable from a professional perspective. Therefore, we offer you the FLEXIMARK® Safety signs. Those warning, prohibition and safety signs made of laminated polyester provide you an extensive long-term labelling complying with ISO 710.